Most annuals prefer rich, well drained soil. Dig in compost, and peat moss to light clay soil in your gardens and landscapes. Bark mulch will hold moisture in the soil and suppress weeds. You will find that some annuals will thrive in poor conditions and with little care - use those for difficult areas. For pots and baskets always use a potting mix, never garden soil, and use fresh potting mix each year for best results. The nutrients in the soil are used up by the plants, fertilizer cannot make up the loss of all the nutrients in soil. Spent potting soil can be added to your compost or dug into compacted soil or heavy clay to lighten the soil. 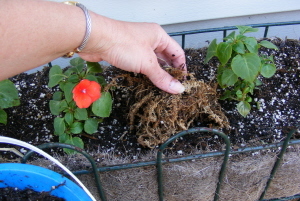 Remove annuals gently from their pots so the roots remain intact. For quart pots, tip upside down with your hand encircling the plant itself. If it does not slide right out, shake gently. Sometimes the roots are coming through the drain holes, holding the plant in the pot. If necessary snip those right off to dislodge the plant. The tiny little seed pots used for 6 and 9 pack annuals are sometimes more difficult to remove with losing all the roots, particularly if the soil is quite wet. Lace your fingers through the plants and tip upside down into your hand. If the plugs do not slide out, shake gently. If necessary press the bottoms of the plug pots with one finger while holding the pack upside down until all the plugs pop out. If this isn't working, let the soil dry out more before removing so you don't lose all your roots. Separate the plugs gently, replacing them in the pack if they will not all be used right away. These will dry out quickly, so be sure to keep them watered while you store them. Potted annuals, as well as perennials, will sometimes be root bound. Roots that are well developed will often grow round and round in the bottom of the pot. The roots sometimes have a hard time spreading out and establishing in this state. Gently loosen and spread out the roots before planting. Sometimes they are so bound you need to break them apart, which if tightly bound will be good for the root system. Grasp the root ball with your fingers at the bottom, and pull gently until the roots break. New roots will sprout from the broken places after you plant them. As you plant annuals, pinch off the main stem about an inch. For annuals with a flowerhead atop a long stem, snap the stem off at the base. It is hard to remove the blooms, but this will encourage the plant to grow fuller. The plant will become more neat and compact. It will also help the plant to initially concentrate on establishing its' roots, rather than maintaining the flowers. Some fast growing annuals may need to be pinched back again to encourage stems that are becoming long to produce side shoots. Petunias benefit from two or three pinchings each growing season. Snipping off spent flowers, known as deadheading, will encourage more blooms for most annuals. This will also prevent seed production for plants that self-seed. and of course, your garden will look fresher. Generally, the spent flower stem should be snipped, or "pinched" off (grasp stem between your thumb and forefinger and snap the stem) below the flowerhead at the first set of leaves. Pots and containers can dry out very quickly, to help them retain moisture they should be mulched. Sphagnum Moss works quite well. 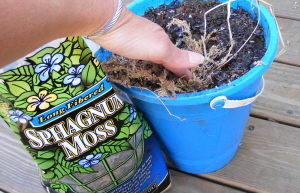 To make the moss more pliable and easy to manage, fill a small bucket with water and submerge moss. Once soaked, the moss will spread over the soil surface easily. This mulching will also prevent soil splash from rain and watering. Feed your flowers! Most hybrids require a fair amount of fertilizer. Use a high nitrogen (24-12-17) liquid fertilizer as much as once a week. Slow release fertilizer can be mixed in to the soil at planting time in addition to regular liquied feedings. Make sure the soil is watered often enough to be consistently moist, but not soggy. Plants need more water as they get larger, and as the summer gets hotter. Try to water in the morning to prevent mildew, and if possible use a drip method such as a soaker hose, which doesn't get the plant foliage and blooms wet. Some of the tough old-fashioneds and native plants are not so demanding.